Jizo statues, found throughout Japan, are seen here at Kiyomizudera, Kyoto. These stone, red-bibbed Buddhas protect children and offer hope and compassion. 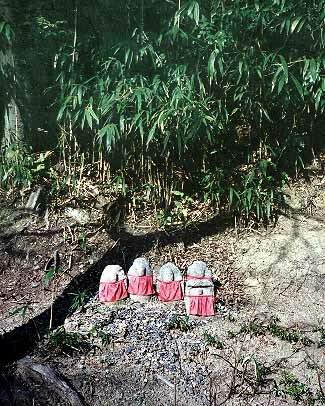 Jizo, stone, bamboo, earth, statue, small, 4, red, cloth, children, protect. Return to the picture index.